If the flyweight division is really going to die, then it is dying a very slow and beautiful death. 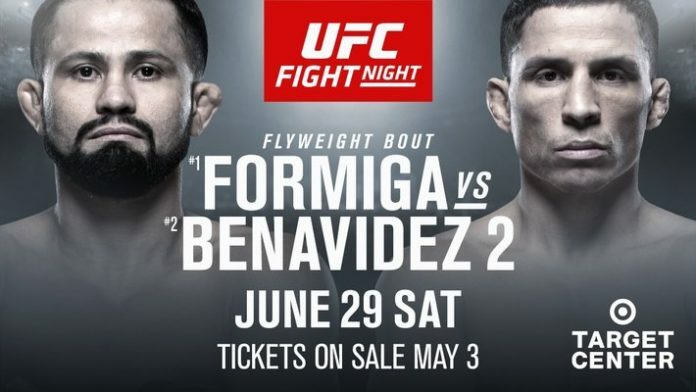 Wednesday, the UFC announced what was loosely advertised to be a #1-contender bout for Henry Cejudo’s flyweight championship, with #1-ranked Jussier Formiga taking on Joseph Benavidez June 29 at UFC on ESPN 4 from the Target Center in Minneapolis, Minnesota. This will be the second time these two flyweights have faced off, with the first encounter taking place six years ago in Belo Horizonte, Brazil. Joseph Benavidez got the better of Formiga, earning a TKO stoppage less than two minutes into the bout. Since that victory, Benavidez has continued to be a pillar of consistency, going on to win the next 8 out of 10 fights. Joseph Benavidez has been one of the more vocal fighters about the need to keep the flyweight division alive while sharing his optimism that he expects that to happen. With the UFC putting together this #1-contender bout in a division that remains very much alive, the prognosis of the division appears to have at least several more months of life to look forward to. Joseph Benavidez may hold a victory over Jussier Formiga, but Formiga sits comfortably as the #1 contender. The Brazilian jiu-jitsu black belt has yet to receive a world title shot, but a win over Benavidez would earn Formiga four consecutive victories over back-to-back top-five opponents. Formida’s last victory came at the expense of Deiveson Figueiredo, who also had title aspirations prior to suffering the first loss of his MMA career at Formiga’s hands. During this winning streak, Formiga has also pulled together wins over Ben Nguyen, Ulka Sasaki, and a man who holds a victory over Joseph Benavidez: Sergio Pettis. do you believe will become the #1 contender for the flyweight championship? Joseph Benavidez or Jussier Formiga? ← HOW DOES PHYSIOTHERAPY AFFECT THE BODY FOR A HELPFUL AND FASTER RECOVERY?